well - "This is always presented as some profound quantum mechanical truth, but the pre-quantum explanation is not any different from the quantum explanation." - I am finding Your lack of faith disturbing... This is simply not true. In classical probability, You have 2 states - Cat is dead - D and Cat is alive - L. If You have no knowledge about interior of the box, You may describe a Cat by some probability equations, and You will have separate results for D and L states. But in quantum mechanics You have additional term - interference L and D. And it may be empirically observed - of course not for cats, but for electrons for example. If You like to see it - just take a look on one of Yours pictures below Your photo. This is it. Yes, we know electrons have wave properties because we can observe the interference. But interference between a live and dead cat? That is the sort of science fiction you might find on Star Trek, but never in the lab. 1. Schroedringer cat is gedankenexperiment and it was provided by Schroediger - in order to show that quantum mechanics is wrong. And it became the Scholar-Book-Example of how it works. 2. it has nothing to do with "wave" properties of electrons, because it is not electron what interfere here, but his wave functions. There is no single experiment where "electrons interfere". You have serious lack of knowledge. If You measure electrons hitting the wall, You will always see that it hit certain, small place on it. 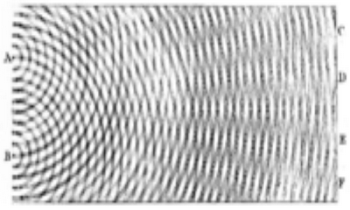 See the Wikipedia article on the Double-slit experiment, where it explains that the popular interpretation is that because of wave properties of electrons, each electron is interfering with itself. The Schroedinger cat is indeed a thought experiment about probability, but it does not prove quantum mechanics right or wrong. Any other theory would have the same dilemma. I don't need five words to describe Quantum Mechanics, I can describe Quantum Mechanics in two words: Half baked. If you like, I can quote Feynman himself (his own two words) and call it a "Dippy Process". Any theory or "interpretation" (a la Copenhagen) of a theory which relies upon a paradox or contradiction to get off the ground is already useless as science since it has about as much mechanical and logical rigor as "..and then a miracle occurred! Praise be Paradox!" How about this interpretation of your interpretation "We have observed phenomena which we pitifully can not explain logically, and have been told by our elders there is no better explanation possible, so we will abide by their judgement and not try to explain it rationally or seek to discover a better answer, but accept irrational paradox as an answer and claim understanding while telling everyone else how profound it all is." Or, by some chance you actually realize you are supposed to be doing physics, not dualistic mysticism, and start looking at an actual three dimensional particle with some non-zero extension moving through three dimensional space, not an imaginary point particle of non-physical abstraction in two dimensions, and realize, hey, if an actual particle is spinning quite quickly while it travels, does it not describe a spiral to some degree? What would the spiral trajectory of a football look like if you viewed it from the side as a two dimensional perspective??? 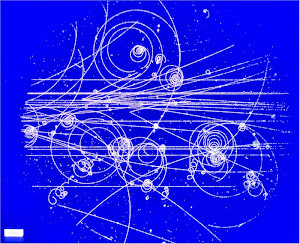 hmmm.... Hey, it kinda looks like a wave...hmm, I wonder..." Try looking at your own posted Bubble Chamber tracks for goodness sakes...notice the spirals? They aren't produced by virtual non dimensional points parading around part time as waves, but actual spinning things with actual physical extension and mass. Just because Niels Bohr had no imagination or any ability to visualize (which he himself practically admitted) doesn't mean there was no other explanation than his self professed "mystical duality" Copenhagen interpretation. As for the joke Schroedinger made about QM involving a cat, Einstein once said "I like to think that the moon is there even if I am not looking at it", which speaks volumes about what he thought of QM, however politely, and how infantile the CI really is. The theory does not rely on any paradox or contradiction to get off the ground. You do not need any mysticism to compute predictions and verify them.